BOSTON–Harrison Manufacturing, a custom plastics injection molding manufacturer specializing in molded plastics and light assembly, recently deployed Rethink Robotics' Sawyer robot at its Jackson, Mississippi, facility and saw immediate tangible benefits, the company reported. Harrison Manufacturing said in a press release that it is reducing labor costs and increasing throughput by using Sawyer in ergonomically challenging tasks. Sawyer also helped improve part consistency and quality by degating plastic parts and passing them on for packaging, a repetitive task that can often lead to human error and injury. Sawyer allows Harrison's employees to thrive in other positions by taking on the degating task that can lead to wrist strain and injury. "We've been seeking an automation solution for this task for some time, but traditional methods weren't affordable or effective for our situation," said Scott Harrison, founder and president, Harrison Manufacturing, in the release. "As soon as we heard about Sawyer, we knew we'd found the answer. Sawyer allowed us to use our employees in less strenuous tasks, while increasing throughput with extended shifts, so we can better meet growing customer demands." Founded in 2005, Harrison Manufacturing (www.harrisonmfg.net) focuses on injection molding and light value added assembly for the automotive and consumer industries. A family-owned manufacturer with high-volume operations, Harrison does not have the floor space for large safety caging units that most traditional robots require, making Sawyer's small footprint ideal. "Repetitive, ergonomically-challenging tasks are prime for automation, and Harrison Manufacturing is a great example of how Sawyer can drive value in several ways," said Jim Lawton, COO, Rethink Robotics, in the release. "From reduced worker strain to increased throughput and part consistency, manufacturers that leverage adaptable, smart robots are improving their manufacturing processes in a significant way." Harrison will soon be implementing a second Sawyer robot in another section of the assembly line. After the first robot degates the part and places it on the conveyor, the next robot will accept the part, package it, and alert a person to palletize it. The Harrison team is also considering deploying Sawyer in a variety of other tasks, including part inspection, quality assurance, pick and place, and line loading and unloading. "I have another Sawyer in the box," said Harrison. "After our experience of quick deployment with the first robot, I expect it to be up and running just as smoothly as before." Rethink Robotics (www.rethinkrobotics.com) is a developer of smart, collaborative robots that can automate many of the tasks that until now, have been beyond the reach of traditional automation. 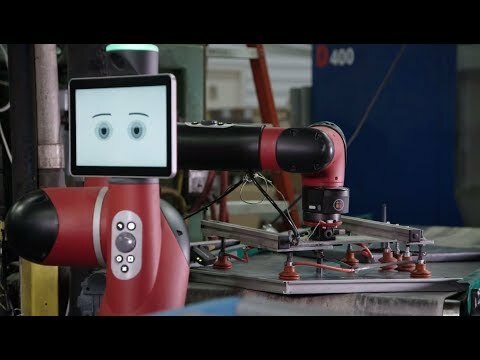 Its Baxter® and Sawyer robots, powered by the Intera software platform, are designed to adapt to real-world variability, change applications quickly, and "perform tasks like people do," the company said.